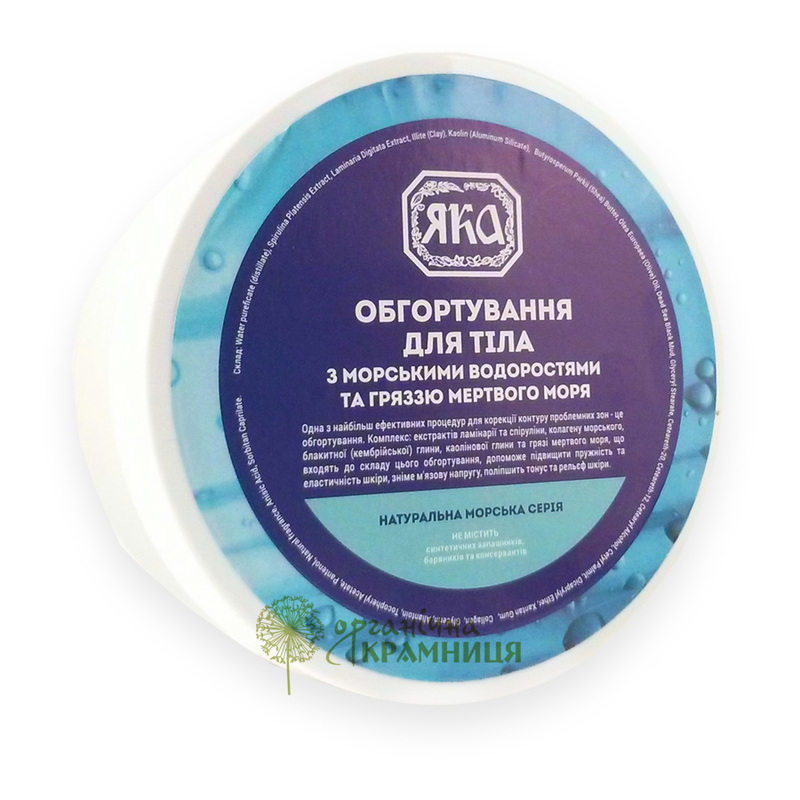 Seaweed and Dead Sea Mud Body Wrap is produced by the Ukrainian beauty brand YAKA for its cosmetic series. It is formulated with natural oils (shea butter and olive oil), laminaria (kelp) extract, spirulina extract, Dead Sea mud, Cambrian blue clay and white clay (kaolin). The formula is based on seaweed (algae) extracts. They enrich your skin with vitamins A, B1, B2, B12, C, D and minerals (boron, iron, iodine, potassium, cobalt, zinc, copper, manganese, fluorine) and have antioxidant, regenerating, moisturising and lipolytic properties. Seaweed extracts also help to get rid of excess fluid and make your skin smoother. The anti-cellulite effect of sea algae is enhanced by Dead Sea mud, Cambrian blue clay and kaolin. These ingredients improve the metabolism in epidermal cells, help to get rid of toxins and excess fluid, stimulate lipolysis (the breakdown of lipids), energise your skin and enrich it with nutrients. The wrap is free of animal fat, synthetic colourants and preservatives. No E numbers. Directions. Distribute an even layer of wrap over clean skin, wrap with plastic wrap and leave the wrap on for 15 to 20 minutes. Unwrap and rinse with warm water. Best used after exfoliation in the shower. Noticeable results can be see after several applications. Ingredients. Water pureficate (distillate), Spirulina Platensis Extract, Laminaria Digitata Extract, Illite (Clay), Kaolin (Aluminum Silicate), Butyrosperum Parkii (Shea) Butter, Olea Europaea (Olive) Oil, Dead Sea Black Mud, Glyceryl Stearate, Ceteareth-20, Ceteareth-12, Cetearyl Alcohol, Cetyl Palmit, Dicaprylyl Ether, Xantan Gum, Collagen, Glycerin, Allantoin, Tocopheryl Acetate, Pantenol, Natural fragrance, Anisic Acid, Sorbitan Caprilate. Want to buy Seaweed and Dead Sea Mud Body Wrap? Call us or submit your order via our web site!